As for the issue of network switch setups for more than 24 connections, we usually stick in the dilemma to buy Gigabit switch: deploying 2 x 24 port switch or 1 x 48 port switch, which one to take? We are here to weight the 2-24 port gigabit switch and 1-48 port gigabit switch pros and cons for your selection guide. Budget is always a big concern before touching other factors. It is somehow a common sense that 2- 24 port switch price is lower than 1- 48 port switch price. Thus many people go for 2 x 24 port switch. In fact, that’s not always the same case. For example, buying 1 48 port switch ($499.00) S3800-48T4S will save you over 200 dollars than 2 24 port switch ($369.00) S3800-24T4S from FS.COM. For people pursuing high performance but with tight budget, just go for FS S3800-48T4S 48 port managed switch, which best satisfies your dual demands. 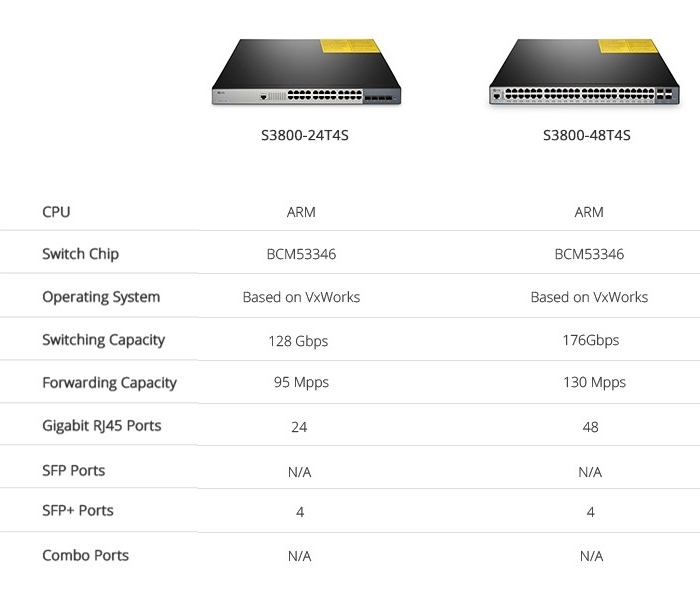 To help you buy gigabit switch: 2 x 24 port switch or 1 x 48 port switch, table below shows the model comparison of FS.COM 24 port gigabit switch and 48 port gigabit switch. For concerning about 2 24 port switch solution, one should know its pros and cons compared to 1 48 port switch. First, having 2 x 24 port switch gives you more sense of security. If one 24 port gigabit switch goes down, users in another switch will still be running. However the collapse of the sole 48 port switch will lead to the whole network’s breakdown. Second, 2 x 24 port switch solution provides more flexibility for separate placing. If you need to connect different devices in different floors or offices, 2 x 24 port switch is the way to go. However, it is noted that this solution has the cons of higher potential bottleneck, less available ports, extra uplink port demand, space consumption and management inconvenience. Apart from the cost-efficiency of 1 x 48 port switch offered by FS.COM, there are other cases 1 x 48 port switch is preferred over 2- 24 port switch. First, 48 port gigabit switch is natural for high-performance network environments. In 2 x 24 port switch solution, due to one extra uplink port for connecting the 2 24 port gigabit switches, a potential bottleneck/congestion is created and only 46 ports are left available for devices. So in cases only one uplink is available, 48 port switch is the choice. Second, 48 port gigabit switch managed has the pros of ease of management and rackspace saving even if 2 x 24 port switch are stacked. Third, one 48 port switch costs less power than the 2 x 24 port switch strategy. However, this solution will lose the redundancy for network outages and separate placing flexibility. After explaining the 24 port gigabit switch and 48 port gigabit switch respectively, we made the following conclusion. For most concerns about performance, one should go for 1 x 48 port switch instead of 2 x 24 port switch, which owns lower potential congestion at the uplink port and can travel at the wire speed. For concerns of space saving, management convenience and more port numbers, also go for the same way. But in terms of redundancy and separate placing, one should better take 2 x 24 port switch. Table below lists the edges for selecting one solution over the other. In some cases requiring for special conditions, pay attention to their built-in features when you buy gigabit switch. For instance, in quiet places such as classrooms, take fanless 2 x 24 port switch because 1 x 48 port switch can be noisy due to equipped fan radiator. For buy Gigabit switch: 2 x 24 port switch or 1 x 48 port switch, it’s extremism to simply say which one is superior or inferior. We decide 2 24 port gigabit switch or 1 48 port gigabit switch to buy by the factors we are most concerned about and the respective edges over the other in each case. No matter you need 24 port switch or 48 port switch, FS.COM would be a good place to go.